WHAT IS IT with these little stacks of rocks? I don’t know where I found it. I pulled it off some website. I can do that, right? I probably should talk to my attorney about that, but for the time being, let’s just say that if it’s your image, and you want me to pull it down, you just let me know. It’s up to you. I would, personally, think it’s something of an honor to have your picture featured here, but that’s just me. But you just let me know. Anyway, what’s up with the little stacks of rocks? I’ve been seeing these things for about ten years now. Is this some stupid zen thing? Or some sappy one-with-nature Indian thi– Oh, oh, pardon me, some Native American thing? What is it? Help me out here. Because I’m seeing these things everywhere, and frankly, they’re starting to piss me off. There it is again. 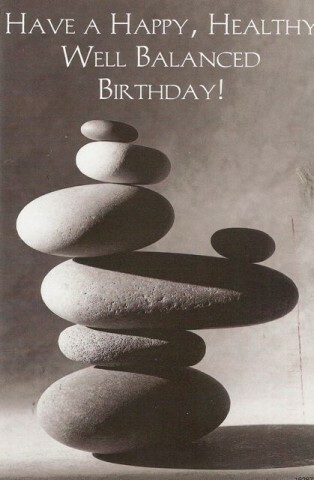 And, no, no, no, it’s not my birthday – thank you, but it’s not my birthday. It’s a reminder from a chiropractor, sent to whoever lived here previously. Must be his birthday. The point is, there it is again. The little stack of rocks. Clearly we’ve gone from mildly annoying trend to hackneyed cliché. What is it with all the stacked stones? Is it supposed to be arty or something? You’re stacking little rocks on top of each other. How is that art? This is suddenly something beautiful? No. You know, it occurs to me the first time I saw this was when I was mountain biking a few years ago, and came up to the top of this ridge out in the middle of nowhere, and there was a little stack of rocks, maybe six, eight inches tall, just like in any of those pictures. It didn’t annoy me then, but it annoys me now, and if it’s still there next time I’m out there, I’m kicking it down. Now, understand: I won’t make a special trip out there to kick it down, but by God, if it’s still there next time I’m out there anyway, it has a date with my foot. Same thing goes for any of these things I see at the beach, because now that I think of it, I always see them there, too. 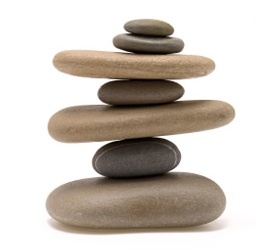 So let’s just all calm down and stop stacking little rocks and then taking pictures of them. Posted by Ted on March 31, 2011, 3:46 AM. Book Club Wednesday: The Vampire of Mons! OKAY, let’s quietly move our chairs into a semi-circle formation, on account of it’s time for Ted Parsnips’ Book Club. I said quietly! Today we’ll be discussing “The Vampire of Mons” by Desmond Stuart and I hope you all read it. It was on your reading list, and as you know it was available at the Elephant’s Trunk Thrift Store in Venice, Florida, for 25¢, at least until I bought it about a year and a half ago. After that, you were on your own. I don’t know what to tell you. Look for it on Amazon or something. Or take a zero for this assignment. Anyway, I finally got around to reading it. And the thing is, I’m trying not to be a total jackass here. I don’t want to cruelly mock other creative endeavors, or the creative types that endeavor to…create…them just because I can, from the relative safety of my ivory keyboard. Because we all have feelings. There’s no reason for me to rip apart someone else’s work just because I can, right…? Having said that, Desmond Stewart died thirty years ago, he’s not reading this, and this “novel” of his was a steaming pile of crap. Look, for my 25¢ I want a good story, not just a good cover. And the cover was good. The cover is what sold me. I spent my two bits based on this cover. 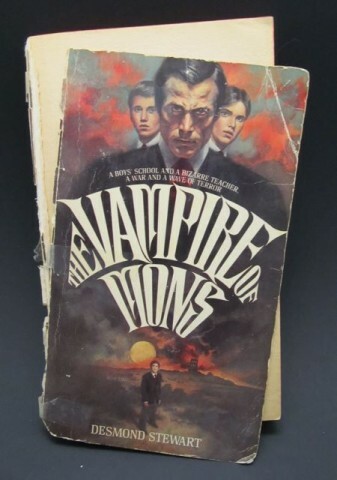 You’ve got the menacing guy front and center – presumably the vampire – and then two boys behind him, and then some kid standing in a field or something by himself below. And you know I was drawn in by the cover, because the damn book is falling apart and I still invested a quarter on it. Turns out this book was nothing but a gay “A Separate Piece.” Oh – oh, excuse me – a gayer “Separate Peace.” A gayer “Separate Peace” but instead of just that vague Gene-and-Finny thing going on, there’s four characters involved, and one of them is the teacher. And despite the title…? There was no vampire! They just thought there was a vampire! And just like John Knowles’ creepy paean to subtle teenage homoeroticism and obsession, this thing takes place in a boarding school during the Second World War. But in England. Though you’d never know that from the cover because none of the people in the cover artwork look British. Awful, awful, book – terrible, meandering, pointless, absurd story and misleading cover art all of which may add up to a lawsuit against The Elephant Trunk; I’m still discussing my options with my attorney. And that quote, ladies and gentlemen, that quote is attributed to John Fowles. I’m serious! It’s like John Knowles, but with an F instead of an Kn. What does this all mean? Who cares! It’s going into the trash now. Any of you who liked it, you’re wrong and you will be graded accordingly. Posted by Ted on March 30, 2011, 1:31 AM. HEY, look what I got in the mail! I was obviously pretty surprised and excited to receive this. 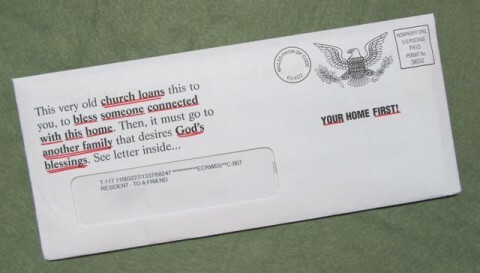 Ordinarily, I would have thought, “Oh, just another piece of junk mail!” But it was the writing on the front that caught my eye – as you might well imagine. A very old church loans something to me, something that will bless me! Key words have been underlined, as though by a red felt-tip pen. Indeed, the most important words and phrases among them have been underlined twice. And by the way…? It was not me who underlined this! The bald eagle by the postmark, too, seemed to underscore this missive’s importance. How very unpatriotic, how un-American it would be for me to just toss into the trash something bearing our national symbol! Besides, by now, this envelope was shaping up to be more mysterious and intriguing than a Dan Brown thriller. Frankly, I was hooked. Now, studying that photo above as you are wont to do, you’re probably thinking “This is very unusual. It arrived at Ted’s house sans any address at all; just the simple and perhaps apropos designation ‘TO A FRIEND. '” I need to be honest with you: I digitally removed my address from that photo. What’s fair is fair, folks: If I’m no longer legally allowed to stalk others, I see no reason why anyone – and I love you all, you know this – why anyone should be allowed to stalk me. So, no, this arrived at the Parsnips home with my street address below that. Anyway, I eagerly opened it up and discovered a wealth of papers inside! Shuffling through them, I found a letter. A most interesting letter, indeed! “Dear…Someone Connected with This Address,” it begins – quite accurately, I might add. After all, there I was, reading the letter, and I am in fact someone connected with this address. Anyway, since it was written to me, and I am at my core a private person, I won’t share the details with you – you understand. But I will say that it sheds some light on that mystery of the “very old church.” It turns out that it is the benign St. Matthew’s Church, and indeed is very old! Sixty years old this year! Can you imagine a church any older than that? As to the other items inside: There was a double-page of testimonials from those who St. Matthew’s have helped. There was a postage-paid business reply mail envelope (More on that later!). “God Is Watching OUR VERY THOUGHTS” was the somewhat conflicting message at the top of a provocative Jesus pin-up, also enclosed. 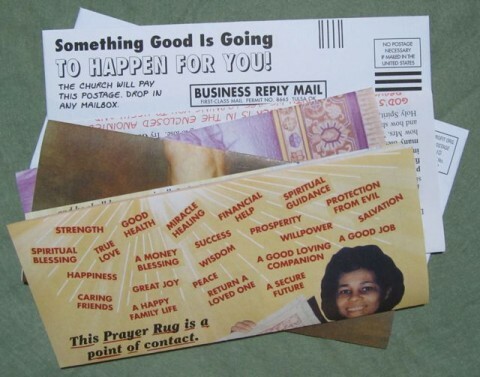 But in this case, the prayer rug measures 11″ x 17″ and is printed on thin paper. Which was folded up. To fit in the envelope. Oh, also I think they’d like it if I sent them money as well. 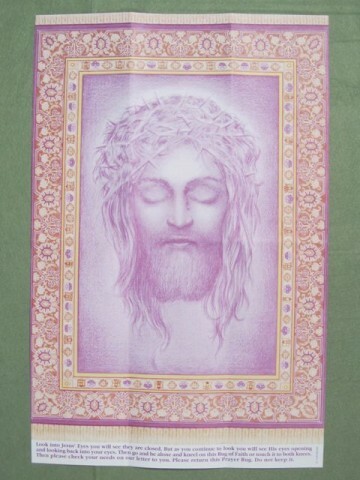 And the most astounding thing about the prayer rug is that you’ll notice – at first, anyway – you’ll notice that Jesus’ eyes are closed. Here, take a look – He won’t bite. And I’ll let you know if both your and my prayers are answered for some sort of editor to reign me in from pounding out these never-ending shaggy dog story-type posts. Posted by Ted on , 2:53 AM. A Dollar For a Sample? Get Out of Here! It’s a sample box of Cheez-Its. I put a Toolie Bird by it for scale. There are 3 pouches inside. 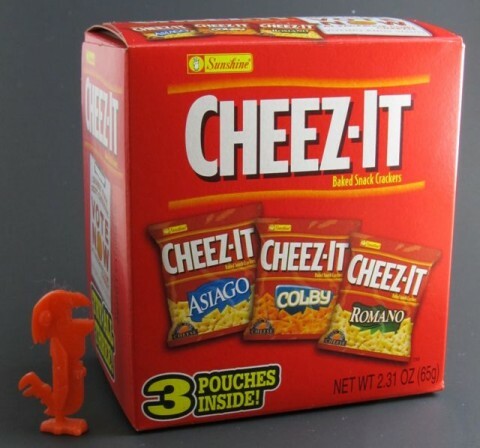 Each pouch features a different flavor of Cheez-It baked snack crackers. Asiago, Colby, and Romano. I had to buy this thing at the grocery store. They charged me a dollar for it. A dollar! Folks, I remember a time when samples were given out for free. Free! Or they came in the mail. And if you lived in a mid-sized apartment complex and you got to the mailboxes before anyone else, you earned yourself 22 little travel-size tubes of Aqua-Fresh. So what has happened to our society that we now think it’s okay to pay for samples? When did this happen? Where did we go wrong? And what has happened to the people at Sunshine that they now expect us to pay for samples? 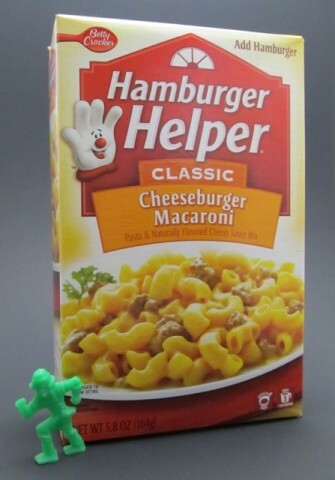 And can we get a close up of the net weight of the entire box…? 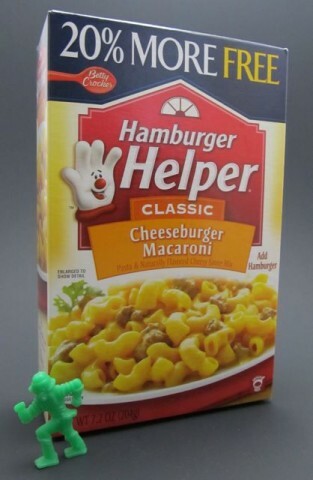 …Okay, well, if you look close, the net weight of the entire box – of the contents of all three pouches – is 2.31 ounces! That’s less than one lousy ounce per pouch! And on top of that, to add insult to injury, after you’ve spent your hard-earned money…they want you to go onto something called Facebook and vote for your favorite flavor! Which by the way is Asiago. Also…? There’s a little card in the box telling you to do this – but no coupon. Traditionally, your samples would come with a coupon to further entice you to buy this new product. I mean, they’re already putting that card in there. Would it have killed them to make one side of it a coupon? I sure like italics, don’t I? So basically we’re – you and me, pal – we’re doing all their research and development for them! We’re paying for the sample! We’re eating the sample – which I might add we paid for! We’re voting for Asiago! We’re doing it all for them! I can remember a time, too, not so very long ago, when these sorts of decisions were made by a focus group! An efficient, unfailingly accurate focus group! A focus group where they paid you to participate! A focus group that when the research company called you and once you found out how much it was for, you lied and said, “Yes, I drink bottled water on a regular basis.” A focus group in some office building down by the airport that you hoped they overbooked so when you got there, they took you out into the hall and just gave you fifty bucks to beat it. But even if they didn’t, you still made seventy-five bucks for spending ninety minutes discussing the upcoming regional test market launch of Dannon Water and turned red when you were admonished by the jackass in charge in front of eleven other strangers that if you didn’t start talking more, they weren’t going to pay you at all, and then when you did start talking more and said you didn’t think Dannon Water would sell because people associate Dannon with yogurt, not water, you got a dirty look. Where was I going with this…? Oh yes, a bit of trivia for you, there – Dannon once tried to launch bottled water, believe it or not. I managed to put the kibosh on that little endeavor, though with my astute yogurt remark. Also, vote Asiago. Posted by Ted on March 24, 2011, 2:51 AM. 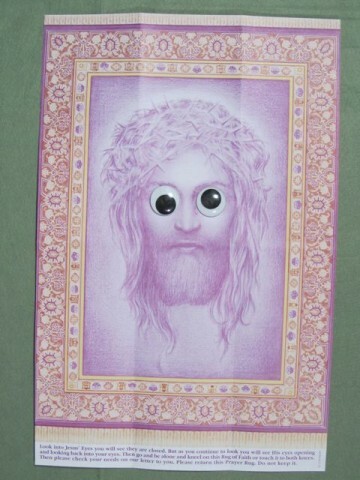 NOW here’s something I want you to take a look at. All of you. Come on over here. He’s from the good people at Palmer – the Easter candy people. 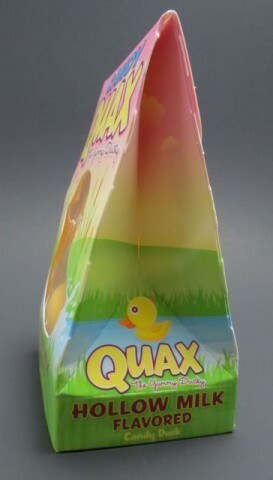 Quax is a delight. He looks just like a rubber ducky. Really. This thing would be right at home in your tub. A little something to eat while you wash, sure. And the package illustration…? As though he’s just this instant splashed down in a pond among the cattails…? A duck – in a pond? Brilliant. Here’s our problem though, and you, you’re smart like me – so you already know what it is. 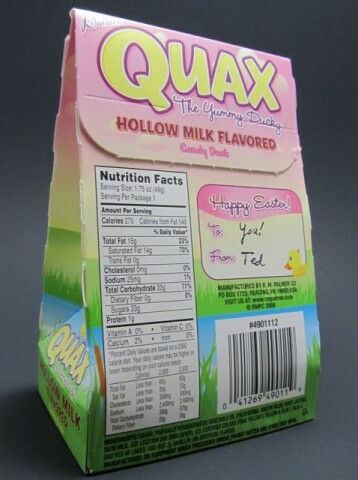 What in the name of all things holy, and also Easter, is “hollow milk”? Do you mind telling me what that is? Now then. 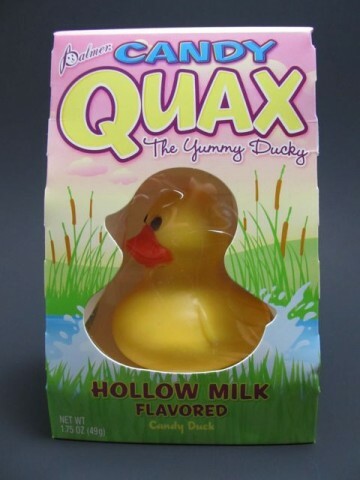 …What is “milk flavored?” And shouldn’t there be a hyphen in there? Posted by Ted on , 2:01 AM. HERE’S something that you will enjoy. I had breakfast at McDonald’s a few weeks ago and I saved a little something from my meal, thinking of you. I just knew you’d get a kick out of it. Look at that! “Mexican Style Salsa”! Ha! Like there’s any other kind! I mean, isn’t that a little redundant? 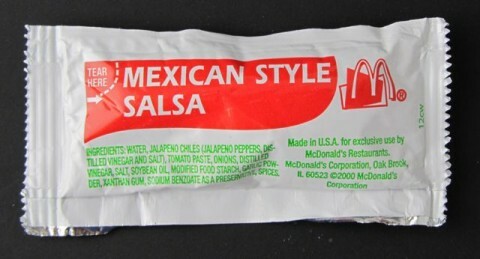 “Mexican Style Salsa”…? Anyway, I kind of had a feeling you’d enjoy that one. Keep coming back. I have a feeling you will. Posted by Ted on , 1:49 AM.